Rise! Break Ground and Make It Yours! Rise! A game that truly shapes to the player's favorite theme. With an ever changing & modifiable board no two games are ever the same! 410 backers pledged $17,518 to help bring this project to life. You can now add Faction Stickers to your workers in Rise! by adding $8 to your pledge for The Faction Sticker Pack. This adds 180 stickers of various themes into the game that you can place on your worker discs! Visit our Updates Page (Update #11) for more details! Crash Games was at BGG Con 2011 with Rise! and we had the chance to play over 100 games of Rise! with our beloved BGG Community. Here is what players had to say about Rise! BGG "Mom" : "This would be a great introduction to strategy for my kids"
BGG "Daper Gentleman": "I really see Rise! 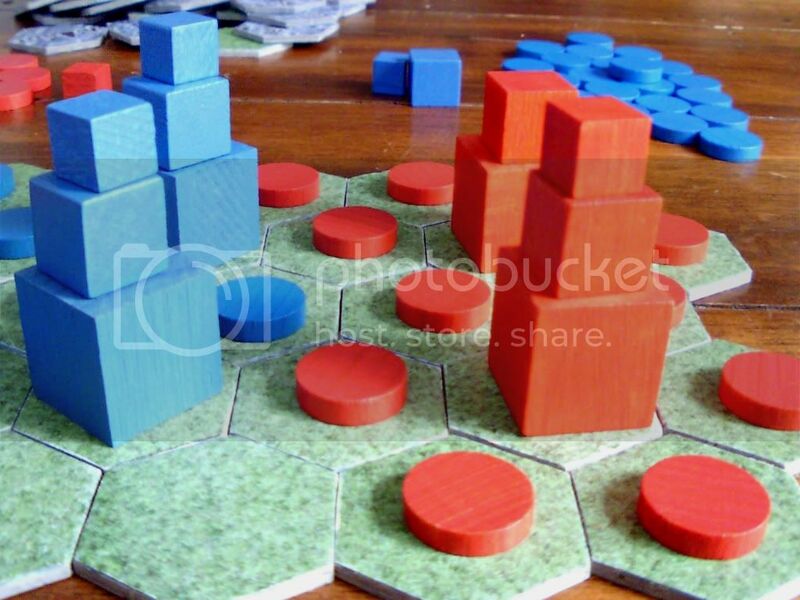 as a really great puzzle game"
BGG "Wargamer": "Rise! is totally a tactical war style game"
BGG "Euro Gamer": "I see Rise! as a worker placement / area control game"
Professional Game Reviewer : "It feels like cultists building monuments to allow Cthulhu to enter the world"
Everyone that we played with had their own take on Rise! Each player took the theme that was most meaningful to them and injected that into the game without even realzing they had done so. It was so amazing to see each player making the game their own! In Rise! you must build three towers before your opponent beats you in a battle to rise to the top! By cleverly surrounding an empty space with six workers you will break new ground and lay the foundation on a path to victory. Take caution though, if you lose sight of your opponent’s plans your towers may be left in the dust! 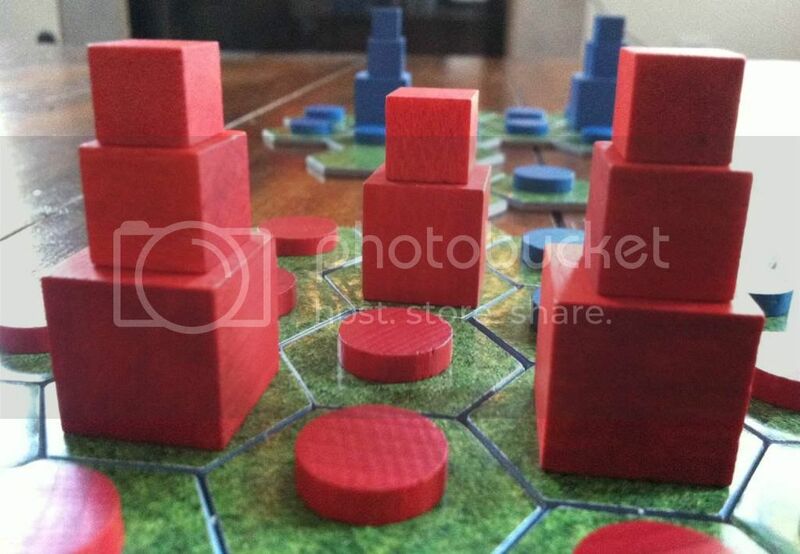 In this simple yet strategic game for the whole family, two players battle it out by both adding to the ever changing board and placing their workers strategically to watch their towers Rise! While seemingly simple the entire game can change with the placement of a tile or a fiendish movement with a worker. What actions will you take in a game where winners must balance their construction with the destruction of their opponent? Now you have the chance to break ground and become a permanent part of Rise! at The Benefactor Tier Reward Level. By pledging $125 you will receive everything in The City Planner Tier plus we will put your name on the foundation side of an actual Rise! tile that will be in every copy we get printed. People will always marvel at your tile! Your name being on a tile is very symbolic of the support you have given Rise! We couldn't have done it without you. You will also get a much bigger version of this tile as a "Thank You" that will be frame worthy. It will have the Rise! logo on it and your name with a thank you from us here at Crash Games! This is something special we wanted to provide only for our Kickstarter backers. The Ballistic Expansion Pack adds a more "take that" element to Rise! with three different types of pieces. Let's take a look at them now. The Anchor Piece- The Anchor Piece is nearly an immovable object. The Anchor Piece doesn't move except when he meets another one of our special pieces which we'll get to in just a minute. The Anchor Piece can wreak quite a bit of havoc when placed near an opponent's freshly laid foundation of one of their towers. The Flash Piece - The Flash Piece moves in quickly and is gone in a flash! When placed The Flash Piece wipes out everything that is on the six tiles that surround it, except towers. Use The Flash Piece wisely though because no one's workers are safe when The Flash Piece arrives! The Vortex Piece - The Vortex Piece swallows everything in its path! When placed the Vortex Piece begins its timer and your opponent has four turns to disarm The Vortex Piece. If The Vortex Piece isn't disarmed, on the fifth turn after placement, the Vortex Piece wipes everything from the board from the six tiles surrounding as well as the tile it is placed on. 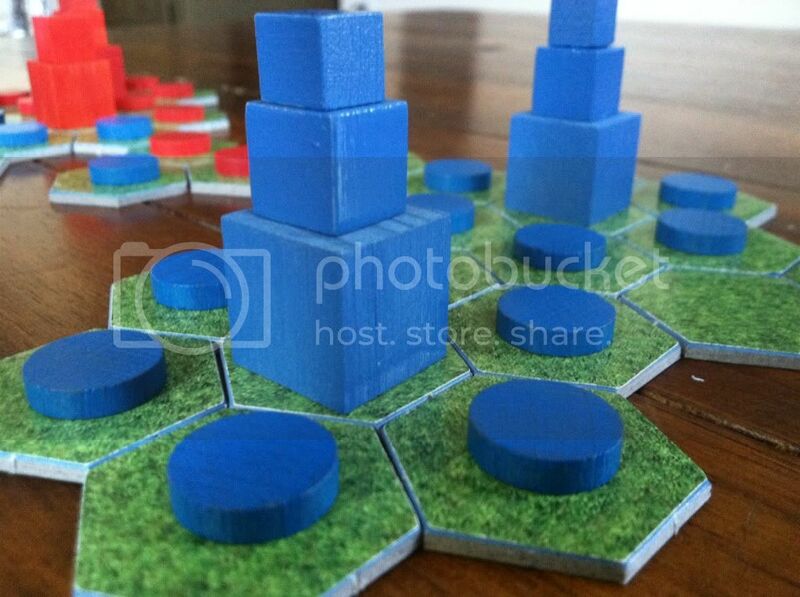 This includes The Anchor Piece, Towers as well as land tiles. To disarm The Vortex Piece a player's opponent must sacrifice five of his workers within four turns of the initial placement of The Vortex Piece. Also included in the Ballistic Expansion Pack for Kickstarter Backers will be a high quality, double logo drawstring bag. It will have the Rise! Logo on one side and the Crash Games Logo on the flip side. This bag will be great to pack your game up and take it on the go if you prefer to keep the box at home! These photos represent what the final components will look like with the exception of a slight color difference. The final product will come with very high quality pieces including over 75 painted wooden pieces and 60 linen covered hex tiles. The photos below represent the exact sizes and material of the components used. 30 Red Wood Tokens, 30 Blue Wood Tokens, 9 Red Wood Blocks and 9 Blue Wood Blocks! Every dollar brings us that much closer, helping us bring Rise! to production. This reward level gets you a BIG THANKS from us and if we bump into you we'll give you a hearty handshake and Patrick might hug you. This reward level includes (One) copy of our game Rise! which includes over 75 wooden pieces and 60 linen covered tiles in a dense, high quality box. Rise! will not be available to retailers until 2013. Free Shipping for U.S Backers. International Backers will need to add $20 to their pledge amount. This reward level includes (One) copy of our game Rise! which includes over 75 wooden pieces and 60 linen covered tiles in a dense, high quality box. Also included is (One) copy of the Balistic Expansion Pack. This is a limited quantity expansion that will be available only to Kickstarter Backers. Rise! will not be available to retailers until 2013. Free Shipping for U.S. Backers. International Backers will need to add $20 to their pledge amount. This reward level includes (Two) copies of our game Rise! which includes over 75 wooden pieces and 60 linen covered tiles in a dense, high quality box. Also included is (One) copy of the Balistic Expansion Pack. This is a limited quantity expansion that will be available only to Kickstarter Backers. Rise! will not be available to retailers until 2013. The City Planner Tier- This reward level includes (Two) copies of our game Rise! which includes over 75 wooden pieces and 60 linen covered tiles in a dense, high quality box. Also included is (Two) copies of the Balistic Expansion Pack. This is a limited quantity expansion that will be available only to Kickstarter Backers. Rise! will not be available to retailers until 2013. Free Shipping for U.S. Backers. International Backers will need to add $20 to their pledge amount. Canadian Backers need only add $15. The Benefactor Tier - This includes everything in the City Planner Tier but so much more! You will become a permanent part of Rise! 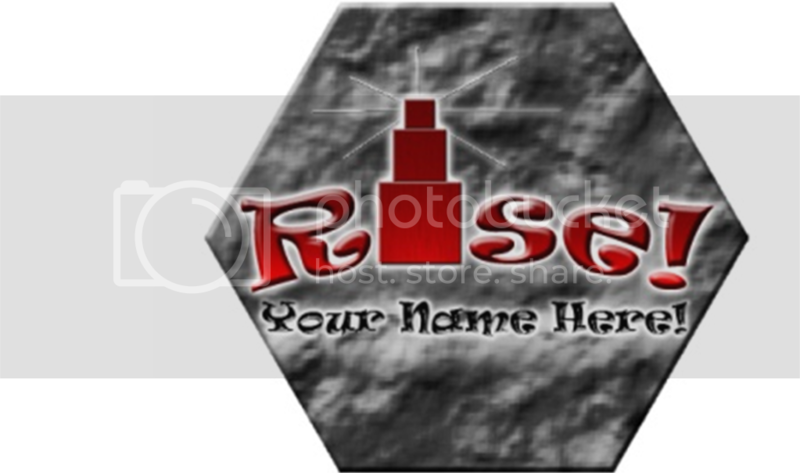 Your name will appear on the foundation side of a Rise! tile symbolizing your crucial pledge that you were a part of the foundation of our success. You will also get a giant Rise! Hex Tile with a personalized thank you printed on it that you can proudly display. Free Shipping for U.S. Backers. International Backers will need to add $20 to their pledge amount. Canadian Backers need only add $15.